United Shades of America will be back. Recently, CNN announced they’ve renewed the TV show for a third season. Season three of United Shades of America premieres on CNN on April 29th at 10:15 p.m. ET/PT. NEW YORK – March 29, 2018 – The critically-acclaimed, Emmy Award-winning CNN Original Series, United Shades of America with W. Kamau Bell, returns for its third season on Sunday, April 29, at 10:15 p.m. ET/PT, following the super-sized season 11 premiere of Anthony Bourdain Parts Unknown. 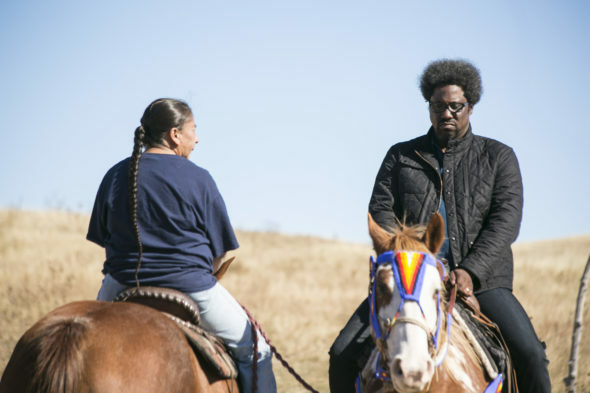 The eight-episode docuseries follows sociopolitical comedian W. Kamau Bell as he explores communities across the country, using humor to start a conversation about race and how our differences unite and divide us. In season three, Bell heads to the border, visits the coast of South Carolina to meet the Gullah Geechee people, travels to Hawaii to talk to natives, heads up north to Canada, meets with students at Historical Black Colleges and Universities, explores Sikhism in America, talks to members of the disabled community, and visits his dad in Mobile, Alabama to retrace his family roots. In the season premiere, “The Border,” Kamau travels to the U.S./Mexico border to find out what life is like for people living there and talk about the proposed new wall. United Shades of America will also stream live for subscribers on April 29 via CNNgo (at CNN.com/go and via CNNgo apps for Apple TV, Roku, Amazon Fire, Samsung Smart TV and Android TV) and on the CNN mobile apps for iOS and Android. The series will also be available the day after the broadcast premiere on demand via cable/satellite systems, CNNgo platforms and CNN mobile apps. What do you think? Have you seen Untied Shades of America? Will you watch season three? More about: CNN TV shows: canceled or renewed?, United Shades of America, United Shades of America: canceled or renewed? I really have enjoyed Kamau putting himself in awkward situations and bringing us to greater understanding of people and their lives. Fell into watching him after Tony, and now Tony’s gone, will definitely continue to watch United Shades of America. I hope United Shades of America returns for Season 4. J.Kamal Bell is funny,yet,smart and teaches many things about our country!!!! I would be extremely disappointed if the Government has changed the return of Season 4!!! I have been waiting forever for this show to return? I love it! I can’t wait to see it again!